I was 9 years old before I realized all little boys didn't grow up to be soldiers and go off to war. My Dad had told me stories of being stationed in Tokyo and then arriving cold and scared near the front lines in Korea just as the war came to a close. He had been drafted just out of high school. His brother was also in Korea. Both of my grandmothers had photos of their daughters as WWII war brides with their handsome husbands in uniform. I knew my grandfather had served in World War I. One of my earliest memories was my cousin Owen coming home in his dress whites from his early Navy days and pitching me into the air while the family stood around chatting on a Sunday afternoon. Later on we went to visit him and his new wife at one of their many posts. While we are not a traditional military family for the most part, many have served. I still have a cousin in the Navy now. Fortunately, I don't know of any in my immediate line who have not made it home. Yet, so many haven't made it back. To all those who give up the comforts of life in our country to defend us and to improve the lives of others, I thank you. 1. Position the cutter in the middle of the design area you want to cut. 2. Press the Center Point button. Select the image you want such as the star from the Plantin Schoolbook cartridge. 3. Select the size for the outside dimensions of your star. I think my largest one was 3". 4. Cut. The cutter will return to its original position in the center of your image when cutting is completed. 5. Dial down the size by 1/2" so my next cut was 2 1/2". 6. choose Repeat Last and Cut again. Then you have an open star. You can repeat steps 5 and 6 to get smaller and smaller images. 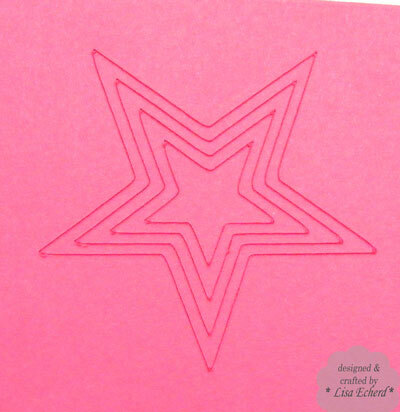 These steps work great for any simple design such as hearts, stars, circles, pointed squares, etc. Thank you for visiting today and thanks to all who serve us. I can't imagine what it must be like to leave your home, family and friends to go abroad to the unknown and unsafe. I hope our cards bring a tiny bright spot into our hero's and their families' lives. 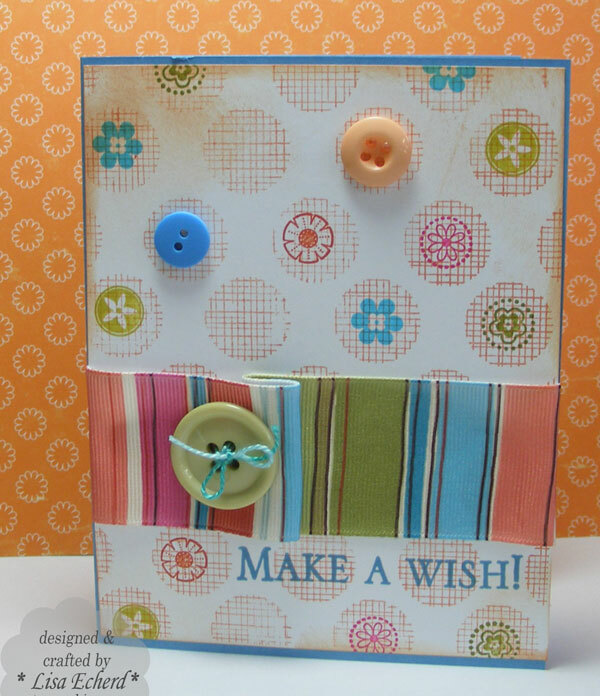 When I get back to my crafting space after a break, I like to start in with a card or other small project often a take off of something I've done recently or a CASE. 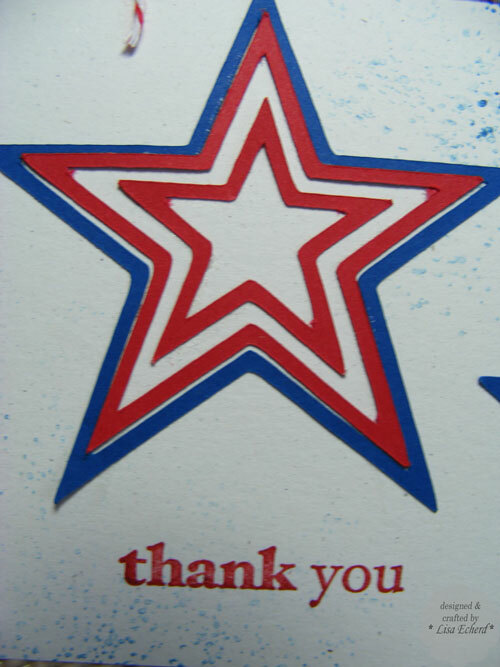 This card uses the same background stamp I did a few days ago. This time I punched hearts and flowers to fill in the circles. Having a little crafting time was necessary yesterday afternoon after spending the morning helping my husband replace our hot water heater. I was the fetch, carry and hold stuff helper; he really did all the work. Thank goodness we have water again! I was in such a hurry to get errands done and get back to the final installation steps that I didn't get to the park for my walk. I hope to do that on what looks to be a gorgeous almost summer day. Hope you are having a fun holiday weekend! 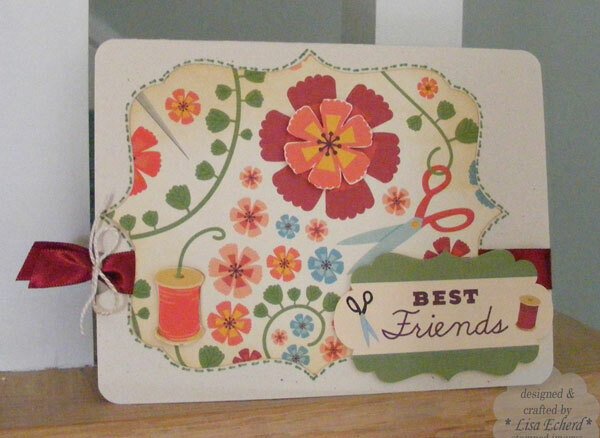 Ingredients: Stamps: Line Dots by Hero Arts; Stitches by Hot off the Press; greeting by Stampin' Up! 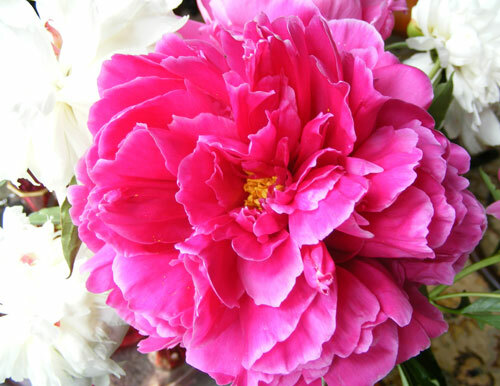 Nothing crafty today; just a pretty peony from our yard. Today's tip is to shop the tool section of a discount store for storage. This is my absolute favorite small item storage system. I believe this came from the home tool section at Walmart. I have another one I use in my workroom that came from Sears tool department long before I started my business. It hold buttons, needles and stuff. 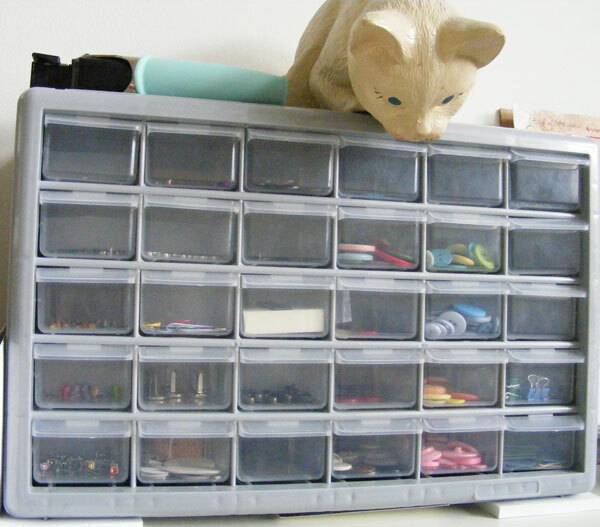 These little drawers are ideal for holding papercrafting embellishments. Embellishments that go with a collection are typically stored with that collection. 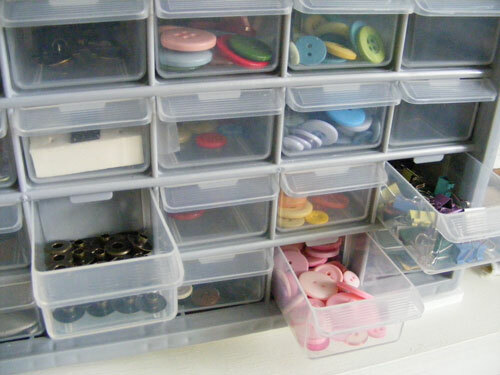 All the others go here: buttons by color, grommets and most of my Stampin' Up! embellishments, binder clips, etc. I keep it right over my worktable so they are handy. The drawers are removable. Sitting on top is this little cat. He/she has it's own story. 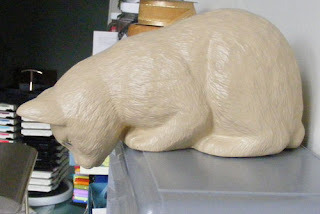 When my husband and I first started dating over 20 years ago, he had to go on a business trip and came home with this little cat to perch above my desk at home and watch over me. Lenny said he had seen these before but could never find one when he wanted to buy a special gift for a cat lover. But on this trip, right after dating me, he easily found the cat in a small town gift shop. (I think he saw it as a sign.) The little kitty has watched over one desk or another of mine for 20 years now. Since I was working with "Big Flowers" the other day, I thought I'd get out the companion set "Little Flowers" and stamp over this background stamp. I've always loved this ribbon which I think came from Walmart ages and ages ago. Hope you have a lovely weekend. We are finally due for some warm, pretty weather! Let's get out and enjoy it. Until a few months ago I didn’t know what an art journal was. Now I’m seeing them all over the place. When I first found out about them I was excited and went out and bought a watercolor notebook with the intention of making that my own art journal. Then it laid around on my guest bed until I finally stuck it in a drawer. After seeing a few more videos and postings about art journals, I decided to give it another chance. Maybe this time I would actually put something on the paper. I’m not really good with just staring at a blank piece of paper and suddenly starting to put something on it. I’m not a doodler. 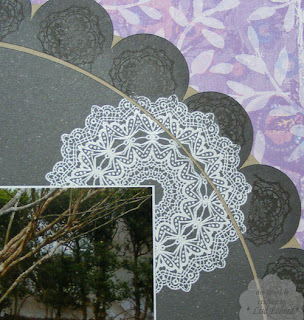 So if I was going to do an art journal I would need some sort of theme or direction. 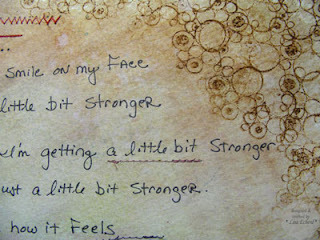 I decided to use my struggles with joint and connective tissue pain as a foundation for my art journal. I wanted it to be inspirational for those days, well, those days when things just aren’t that great. 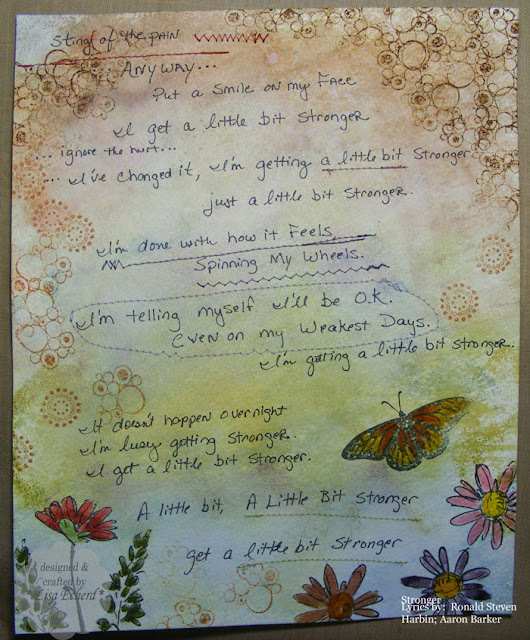 For this first page I chose the lyrics from a song I’ve been hearing on the radio lately. 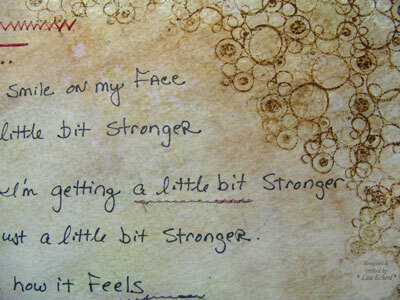 Every time I hear the song Stronger sung by Sarah Evans, it reminds me that I’m making progress, I’m no longer spinning my wheels, I am getting a little bit stronger every day. So for my journal page, I wrote out the portions of the lyrics that are applicable to my situation. The song is about recovering from a failed relationship. I’m trying to recover from the times my body fails me –some of those are temporary conditions and others chronic. First I wrote out the lyrics with a black Sharpie. Next I used Ranger Ink to create the background. I pressed the ink pads to my craft mat, spritzed them with water, and dipped in the paper wiping off the excess. I started with darker more clouded colors at the top and work down to brighter lighter shades on the bottom. I wanted to emphasize that I was getting to be more like myself again as I'm a bright and light color person. I used some stamps at the top and the bottom of the page to show the confusion at the top and the better life at the bottom. 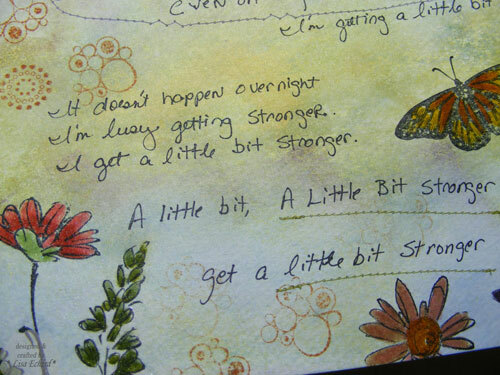 The stitching was meant to emphasize certain sections of the song. It’s the only part of the page I’m not crazy about and I’m not sure why. Part of doing art journal is experimenting with different techniques and seeing what you like and what you don’t. Normally I love stitching on my pages it just didn’t work for me here. The final step was to spritz with Angel's Glimmer mist. I waited until after stitching so as to not get any glimmer on my sewing machine. The page is now propped up over my worktable and I can see it from where I sit with my laptop which isn't really on my lap - another adjustment I've had to make. Eventually I'll put in a notebook. Now that I've done one page, I've got lots of ideas for other pages. It was fun to do and truly therapeutic. Stamps: Circle and Dots by Inkadinkado; God's Beauty and Petal Prints by Stampin' Up! 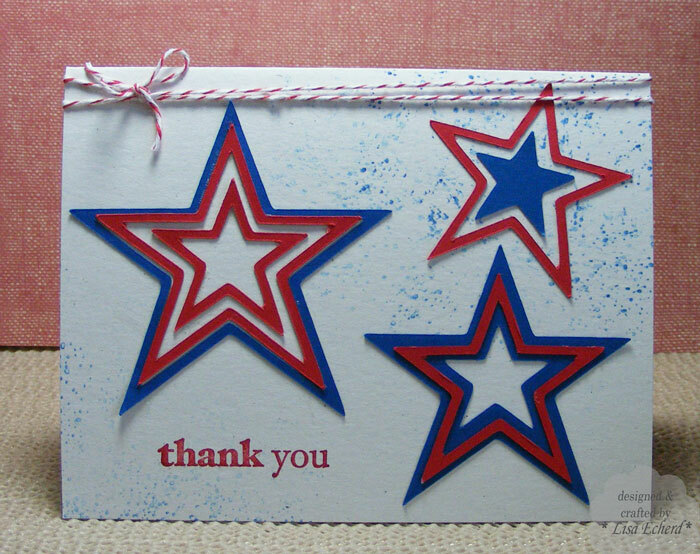 Various markers by Stampin' Up! Still hoping for a little sunshine here! The rain has not produced flooding, of that we are very thankful. My heart goes out to those who are dealing with the floods. While we wait for better weather, here is a bright card based on the Greenhouse Gala paper from Stampin' Up! I'd been saving this paper for a series of scrapbook pages. I'm nearly through the pages and have hardly touched the paper. Sometimes things just don't end up going for what I bought them for. Anyway, it is pretty paper and I'm sure it will find a home. 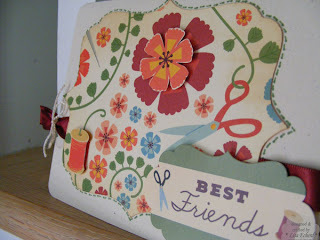 I haven't used the Big Flowers stamp set in quite awhile. It has always been one of my favorites. 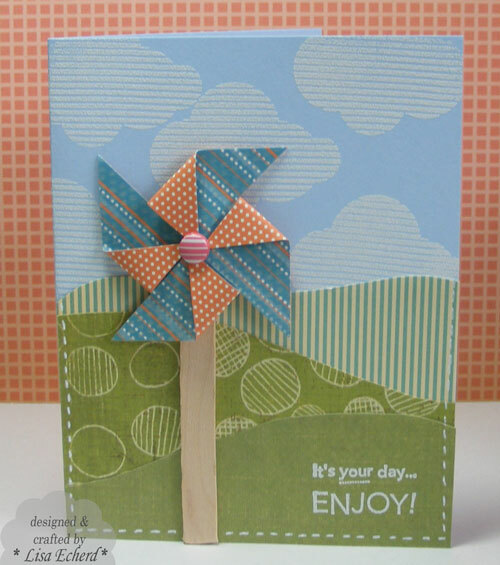 I'm using the three circular elements in place of squares in this week's card sketch from Splitcoaststampers. 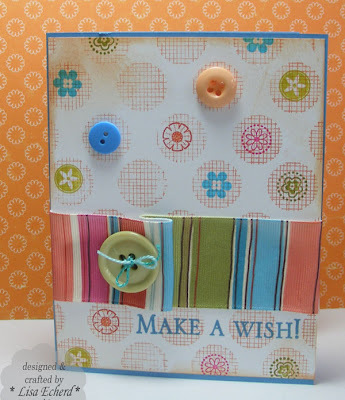 I did several of these cards to start populating my next OWH box so I stretched the ribbon by cutting and stapling on the ends. Ingredients: Stamps: Alpahbet Soup and Big Flowers from Stampin' Up! "Create a stamped border" is the challenge for this month's Scrapbook Stamping class by Nichol Magourik at Two Peas. Nichol's examples have been using a lot of word stamps. Most of my word stamps - well, all of them almost - are geared toward card greetings. 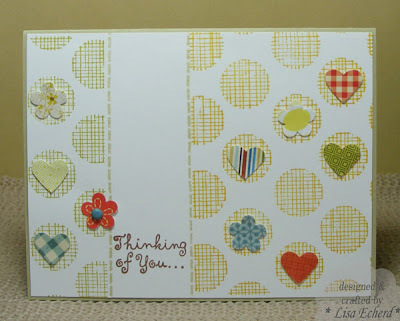 Yet some like this one from Cloud 9 are great for a scrapbook page. In this case it is the perfect saying for friends who have relocated across country. 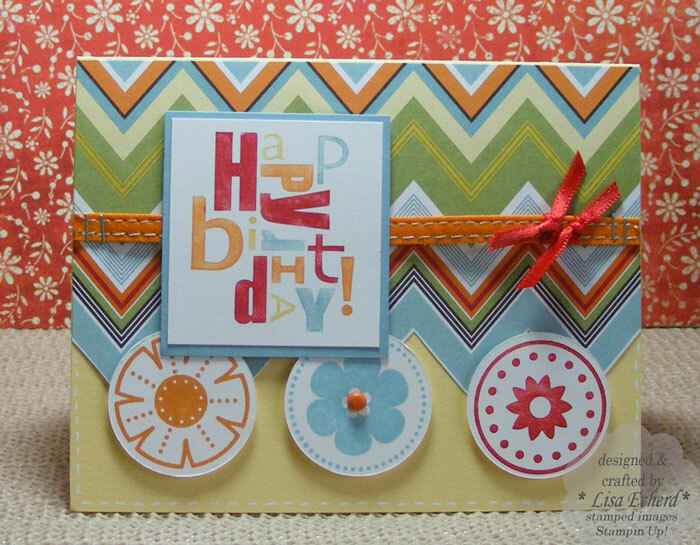 The real challenge was how to stamp the greeting in multiple colors across a border rather than in a group as is shown below on the acetate sheet. This stamp started out as one text stamp. After several tries with markers, masking, a little cursing and near tantrum throwing. I finally reached for the scissors and cut it up. I've done this before but very reluctantly. I was particularly uneasy this time because some of the script words overlapped the block print and I wanted them in two colors and markers just weren't taking on this type of clear stamp. I was very pleased with the results! It still took a couple of tries to get a satisfactory stamp and have everything placed where I wanted but was sooo much easier! 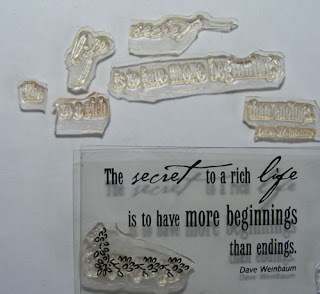 Have you cut up a clear stamp before? I wouldn't recommend chopping up your favorite, irreplaceable stamp but you might give it a try the next time you want to get something in multiple colors and markers don't work. Or if you are going for a different arrangement than the stamped image intended. 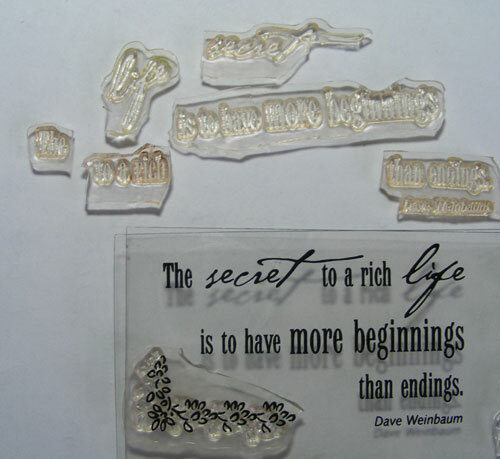 It is just one more way to make the very flexible stamp work for you. 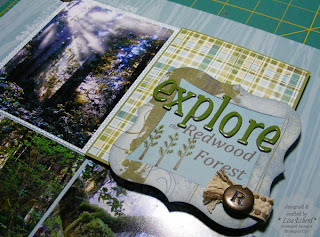 The page is also for the Scrapbooker's Anonymous challenge to use stamps to create your own designer paper. The zebra paper is stamped in black ink, clear embossed on white cardstock. 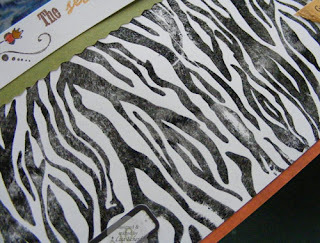 I'm not that much of an animal print person so I don't typically have animal print papers in my stash. Actually, do they make animal print papers? Probably, a little animal print can be a lot of fun in fabric so it would be in paper, too. In honor of the kitty, I stamped a border around the top of paw prints to add a little more embellishment. Ink: black, Chesnut Roan, Amber Clay by Colorbox; Dusty Durango by Stampin' Up! It is a happy day when I get an Operation Write Home box in the mail as I did today. I haven't been making as many cards lately - or as many multiples anyway - but I did clean out one of my storage drawers last week in preparation for some new paper coming in. 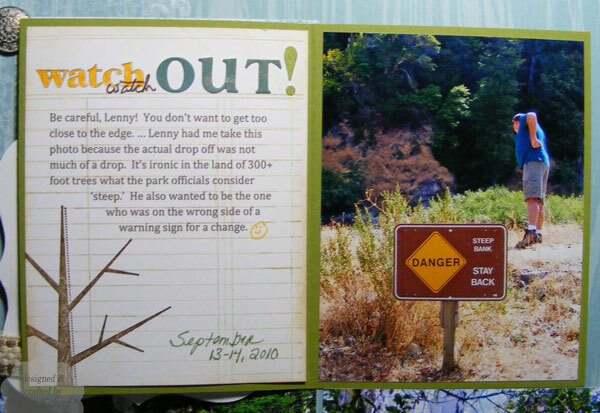 I had a stash of birthday cards that were part of a class I did a couple of times last year and they had just been waiting on me to use up the rest of the supplies. So I made a few more of those to add to my box. One of these cards also went in the box. The other goes to a friend's daughter who has a birthday coming up. For these I used Hampton Arts Cupcakes stamps which has these cute package designs and greeting. 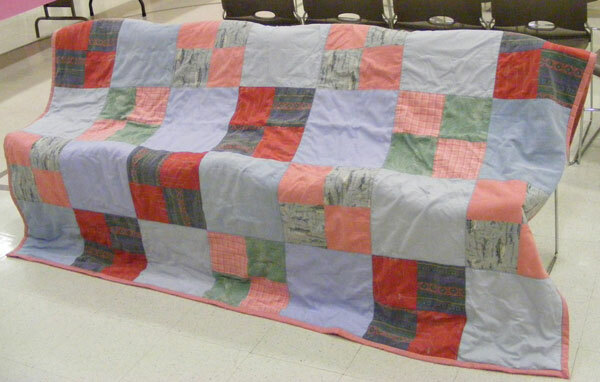 On Friday, I shared the quilt I made for a friend's grandchild. 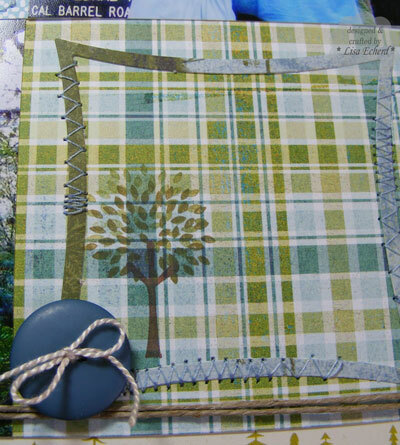 For the scrapbook page, I followed two challenges: Two Peas May class called Products You Love and Shimelle's weekly sketch challenge for this week. Judy called me in the early fall of 2010 after we had found out Ashley was pregnant and asked if I would make a quilt for the baby. “Of course,” I said. She wanted me to make it from Steve’s shirts as a way to connect him to the baby. Eventually we found out the baby would be a girl and Judy added a couple of her own shirts so we would have some pink/coral colors to go with all the solid blue ones and the gray and green tropical and fishing themed shirts. I was surprised at the size she wanted but understood this would be a quilt her grandchild could use all her life. With a large size quilt and limited time, I did a simple 4 square design, alternating in the blue squares since we had more of this color than anything. I did a decorative stitch over the seams. 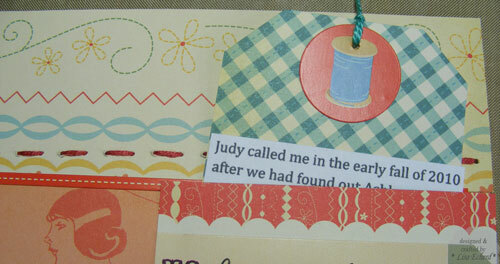 Judy, Mother and I held our own little quilting bee to tie or tack the layers together and sew on the binding. At the shower, Judy got Ashley and Gibson to open this gift first. 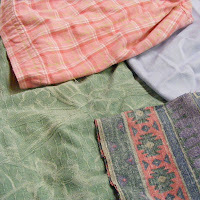 Ashley was the first to recognize a fabric as one of Steve’s shirts. Even though baby Carrington will never meet her grandfather, she will have a part of him near her. I’m happy to have been part of providing that link. The kit and the sketch made this one go super fast. Thanks for visiting with me today! If you haven't already, go to the next post down and click on the Blogger's Quilt Festival button to see many inspiring quilts. This is not the fanciest quilt I’ve ever made. It is not the prettiest. It isn’t the most expensive. In fact, it cost very little in dollars. But it may be one of the most meaningful. 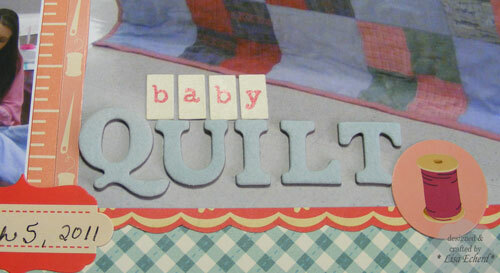 A few months ago, my friend, Judy, called and asked if I would make a baby quilt for her grandchild. We had just found out her daughter-in-law was expecting. Of course, I said. I was probably going to do this anyway as a baby gift. She went on to say that she wanted to make the quilt from her husband’s shirts. You see, her husband died in an automobile accident last spring. She wanted a way to connect him to the baby. So she brought me some of his shirts and then we waited (and waited - the little one was camera shy) to find out whether the baby would be a boy or a girl. A baby girl was expected so my friend went through her own clothes and brought me a couple of coral/pink shirts to add to the blue, green and gray ones. There were more blue shirts than anything so I made the solid alternating squares from blue and did a simple 4 patch for the other squares. She wanted this to be a large quilt the child could use as it grew. The finished size is 60” x 84.” I had to keep it simple to get it completed in time for the shower. Thank you for visiting today! 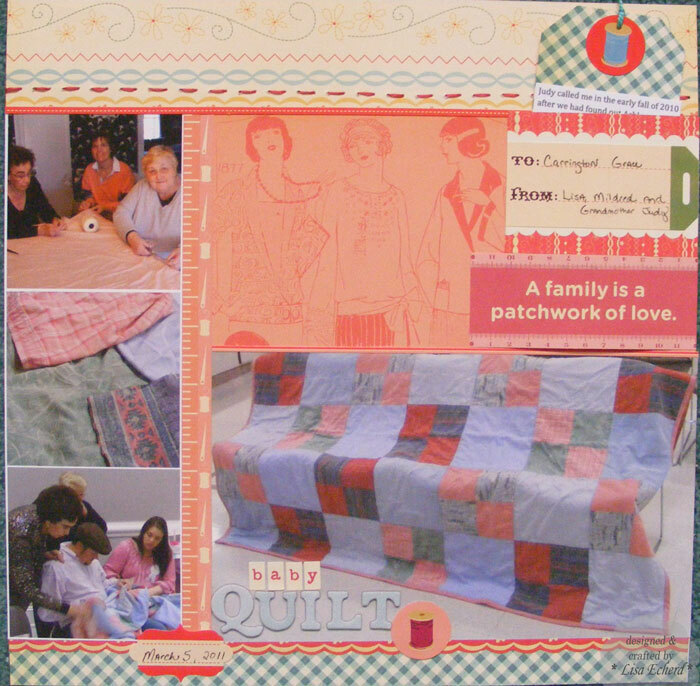 Hope you are enjoying the Blogger’s Quilt Festival. There is so much inspiration here! Thanks to Amy for putting it together, too. The rest of the card was inspired by one from Kristina Werner's blog. She used flowers in front of her green hills and die cut clouds. I stamped my clouds with one of the cloud stamps from Hampton Arts Whoo Loves You stamp set. I should probably leave it on my worktable all the time, those clouds get so much use :-) They now have the set at Two Peas Hampton Arts Who Loves You? I hope all the bloggers will get to participate. Something is apparently going on with Google's Blogger. I couldn't get on this morning and one of my posts is missing. They say it will get restored. I've missed my blog this morning! My sister-in-law's birthday is coming up soon and I made this card for her. Could not wait to break into those Basic Grey Sweet Thread papers! 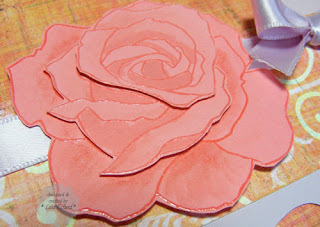 The rose is stamped three times in Versamark and embossed. Then I cut out layers and added some shading with watercolor crayons and a blender pen. The layers are adhered with glue dots to give just a little dimension but not too much. The layout is from today's sketch challenge at Splitcoaststampers. Ingredients: Stamps: Fifth Avenue Floral from SU! 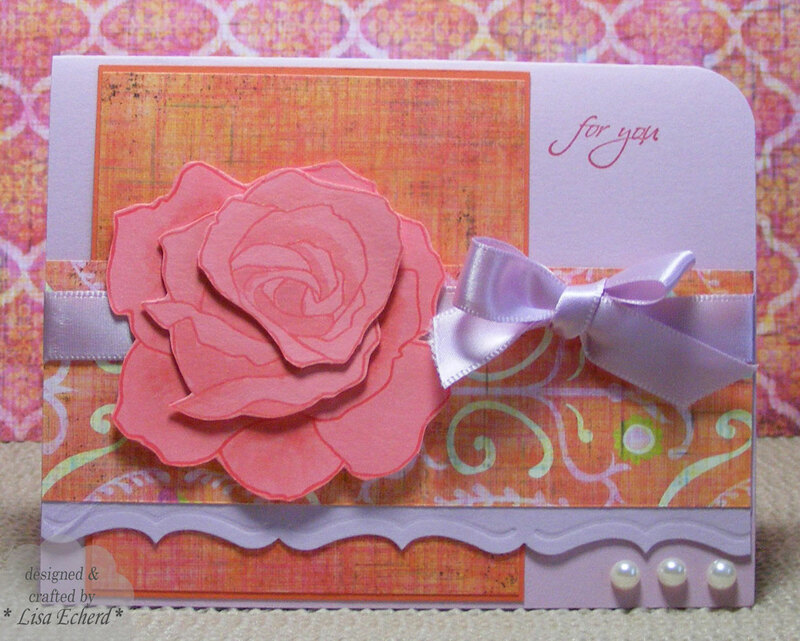 Cardstock: Lilac from PTI; Cameo Coral and Pale Plum from SU! Ribbon: PTI; Pearls from SU! Project notes: The scallop circle is cut with the Cricut and the Straight from the Nest cartridge. 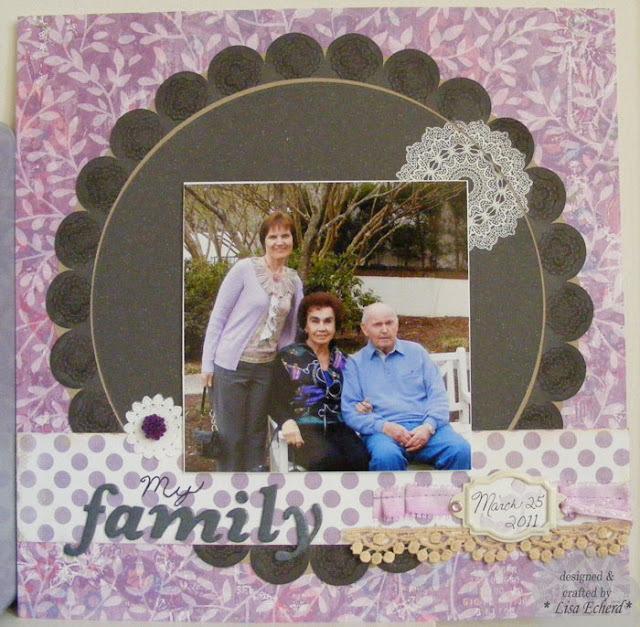 I stamped each scallop with one of the smaller doilies from the Stella Rose stamp set from My Mind's Eye. First I had stamped the larger scallop and embossed in white. Really pleased with how the intricacy came through in the embossing. For both pages, I had to do a lot of stamping and pulling together embellishments to create this unorthodox color scheme of kraft, purple and charcoal. It is just what worked with the photos - even though the paper crafting industry seems to treat purple/lavendar as a forgotten step-child. It is one of the colors of the rainbow! Project Notes: words are cut on the Cricut with SCAL software. 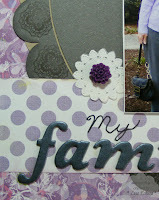 Used the MME doily stamps in tone-on-tone and white embossed over vellum. Also used some embellishment from Stampin' Up! Pretties kit. 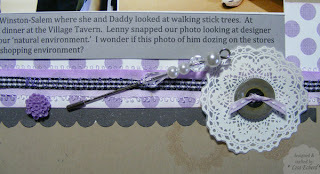 DSP: Picket fence from Lily Bee (polka dots); DCWV for the purple print. Cardstock: Crumb Cake by SU! Embellishment: Sculptured flowers and lace by Prima, Vanilla Hodgepodge hardware from SU! Sometimes there are just so many wonderful designer papers to choose from it is hard to know what to buy. I've bought my share of beautiful papers that just stayed on a shelf always passed by because they never worked for a page. I'm finding I need more of the basics. 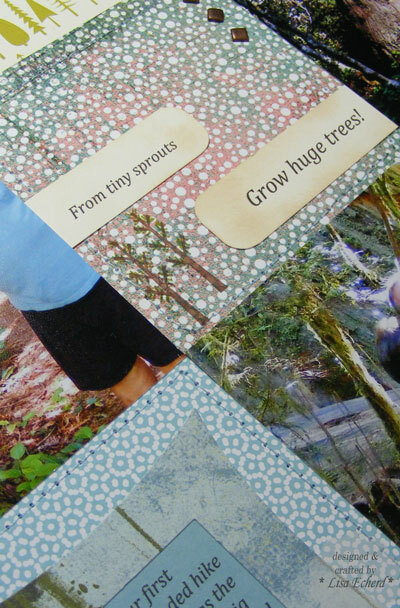 Here are a couple of tips on paper selection. The tips are in the first half of the video. The rest is just the fun stuff I've gotten in my last couple of orders. Don't overlook the "B" sides particularly with holiday papers on sale. 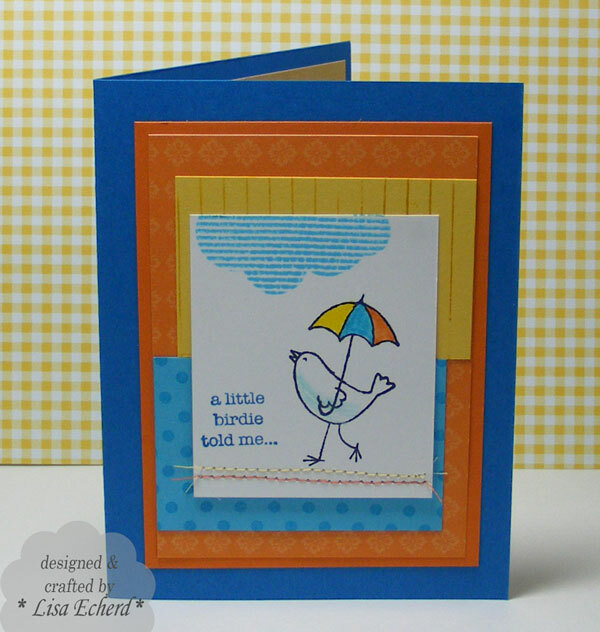 Look for simplier tone-on-tone, light colored papers for backgrounds. You can add distressing, you can't take it away. I'm actually surprised at many of my purchases. Surprised because I stuck to what I said I wanted to buy (I usually change my mind a dozen times). During CHA I did a post on products that appealed to me and I've bought 4 out of 5 of those items and haven't gotten into too many other things. Thanks for visiting today! Tomorrow I'll have two layouts from National Scrapbooking day (weekend). Happy National Scrapbooking Day to you! Hope you have time for a crafty project today. 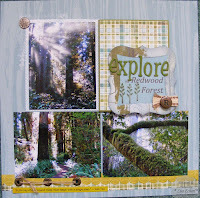 Here is the companion page for 'explore Redwood Forest' from several days ago. I finally put the finishing touches on it this morning. 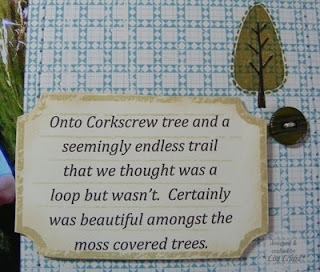 The Trendy Trees set helped out with the embellishments. I forgot to leave room here to use my Stamp-ah-mah-jig so I stamped the green part and just colored in the trunk with markers. A love to add a little machine stitching to gridded pages to tie them together. Thanks for visiting today. I won't keep you long. If you are like me, you have plenty of projects running around in your head waiting to get on paper. 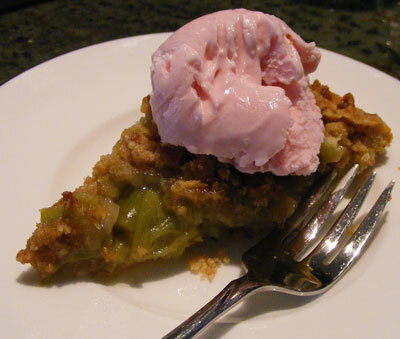 My husband has often hinted at having rhubarb pie. He has been growing rhubarb for a few years now so I guess that is more than a hint :-) The cookbook I got for my birthday had a recipe so I gave it a try today. The recipe also suggested serving with strawberry ice cream which he declared to be the perfect touch. 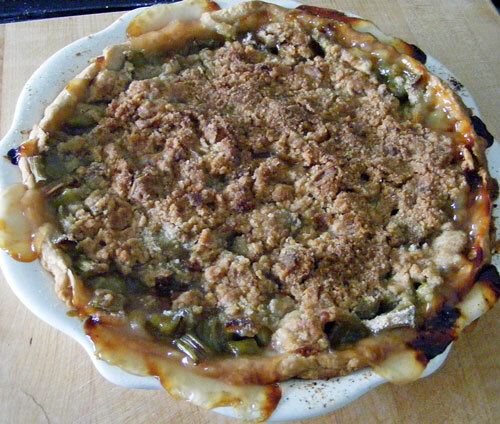 As you can see, I'm not that finicky about getting the perfect pie crust so it doesn't have a fancy edge. I'll leave the fancy stuff for paper and fabric where I have a bit more luck. This is my first effort from the Pies and Tarts cookbook by Martha Stewart and so far it is a hit! Who inspired you toward a crafty hobby? Or did you pick it up on your own? Have you always been surrounded by family and friends who create things with their hands? Perhaps one or two people influenced you. That question is the first phase of Two Peas in a Bucket’s latest event called Connecting with Creativity. When I think of that question the first people that come to mind are my mother’s sisters and two very good friends. And while I started creating at a very young age with the help of these wonderful people, my exposure to handmade items goes back to before I could even walk and talk much less hold a crochet hook or a needle. 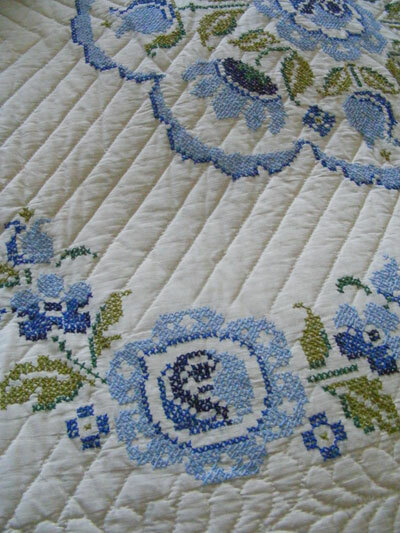 When I was very young, I can remember my mother cross stitching the designs on what became her bedspread. 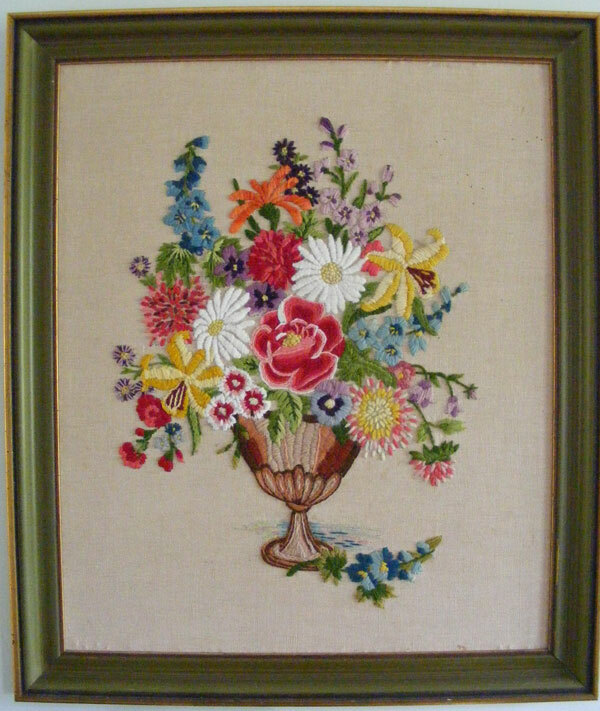 I remember going with her to take the completed cross stitch top to an older lady’s home where it would be intricately hand quilted. There were other projects mother did including some decoupage plaques where she put dozens and dozens of coats of polyurethane over the surface standing between each one. I don’t recall seeing her make the crewel embroidery picture shown above but I do know that she made it and it was in our house when I was growing up. About four years ago mother and I were going through some things in storage and I came across this as well as a needlepoint picture that she did. This one now hangs over the desk in my living room. The decoupage Four Seasons pictures are displayed in her hallway. My mother’s creativity was redirected towards the business that she and my father started when I was four. 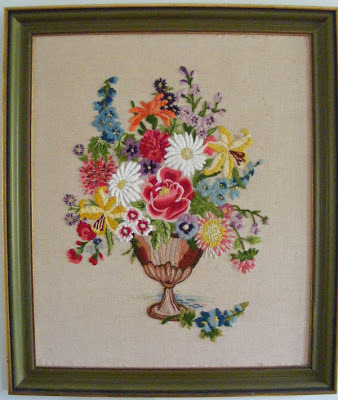 My father started by framing pictures –he framed the embroidery that she did and later my early efforts at embroidering. They soon expanded into offering draperies, wallpaper, and carpet. Mother helped customers select the furnishings for their home. She also had a young child, my mother in law, and parents who all needed her time. So the time for embroidery and other projects just disappeared. Now that my mother has retired she has taken up gardening. She uses her creative energy to arrange her plants and create a beautiful, inspiring yard. I wish I had her energy as well as her green thumb! Now that I think about it I’m sure my mother’s creativity was influenced by projects that were done in her home. My grandfather was a cabinetmaker. He delighted in working out how he was going to make something. She’s fond of telling me how he could do anything. He and my Dad's father built my parents home they still live in today. My grandmother quilted and was a wonderful cook and gardener herself. So when I first think about it, it’s a little harder to connect the dots because we all do different kinds of crafts. Yet the desire and the ability to create beautiful surroundings is a thread woven through my family for generations. 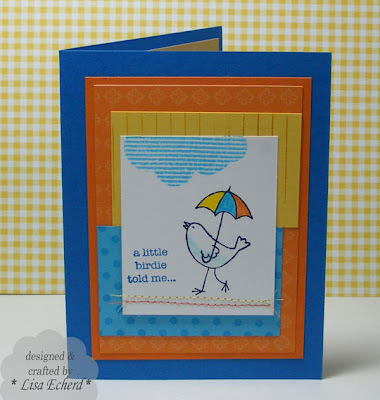 I needed a bright and cheery get well card so I chose colors from the Brights palette of Stampin' Up and one of my favorite sets - A Little Birdie Told Me. 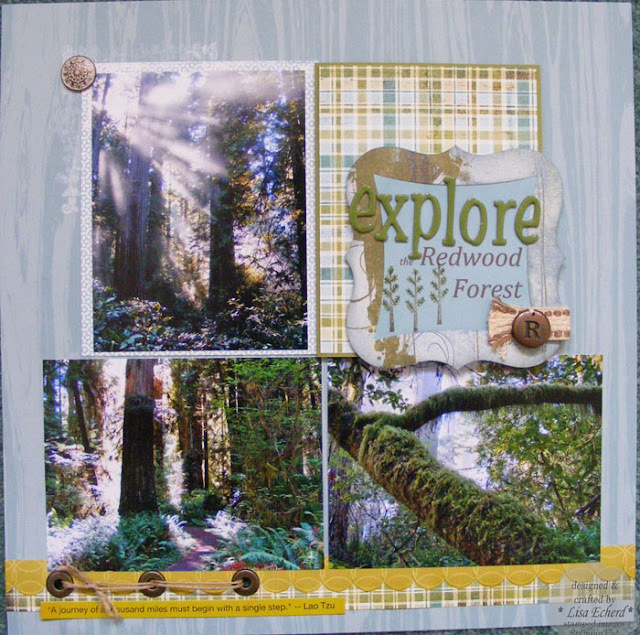 The layout is from this week's sketch challenge at Splitcoaststampers. I felt a bit like I was arranging one of those wood block puzzles where all the pieces have to fit just so to achieve the arrangement of all these rectangles. It is a fun sketch because you get to use so many colors if you like. 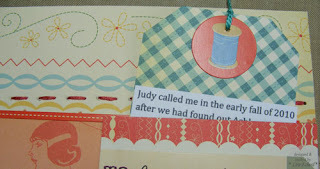 Rather than bulky ribbon or other embellishment on a card with so many layers I used a little stitching for embellishment. Also there is some tone-on-tone stamping to dress up some of the cardstock. The yellow 'stripe' is actually the ledger stamp from Hero Arts turned on its side. Anyway, hope you are having a pleasant day! Thanks for visiting. 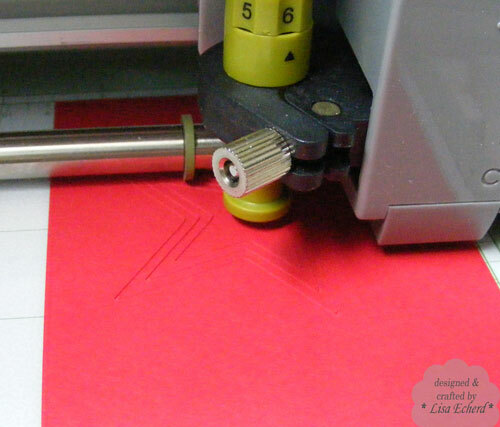 Today's tip applies to the Cricut or to any electronic cutter with a cutting mat. Sometimes you want to have an image cut from a very specific area of your paper. In this case, I wanted to be sure the flower, spool of threat and the scissors were within the pointed square design I was cutting. I didn't want anything to get chopped off by misaligned paper. In this video, I have made a sample cut and used it as a guide for placing my designer paper in the perfect position. I've had to do this a few times when I had precious little paper left to be sure that the Cricut didn't cut half of a letter on and half off my paper and leaving me without enough paper to recut. Sometimes we have to fool our tools to get them to do what we want. We are the humans, we can't have these contraptions outsmarting us, can we! To finish up the card, I cut out an additional spool of thread and a smaller flower to give the card more dimension and did some faux stitching to go with the sewing theme. Hope you are having a good week. Thanks for spending a few minutes here. 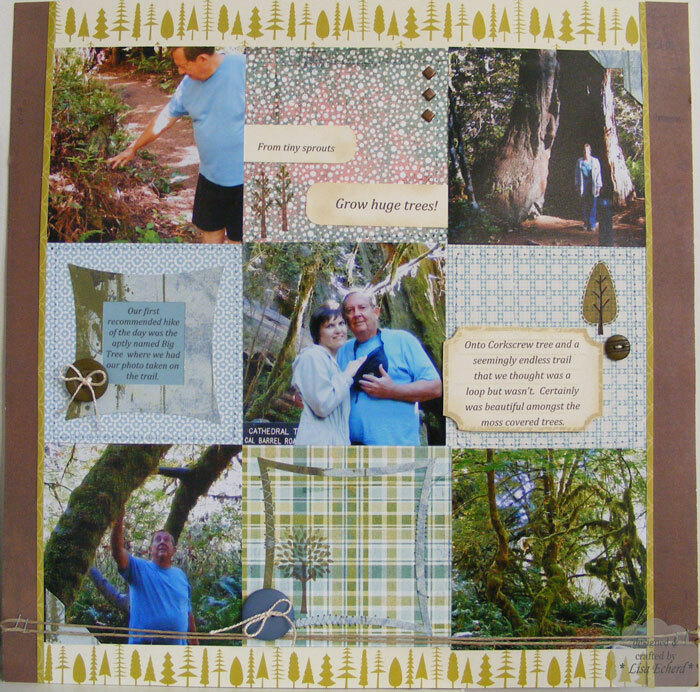 April's 4x6 Photo Love class (April 30 at Two Peas class here) is about using 4 photos on a layout. But where is the 4th photo? Hiding! I haven't done this trick of hiding a photo in a long time. Usually, I've used it because I had so many photos to display that you flipped one photo back to find another tucked underneath. This time, based on Shimelle's layout, the top is for the title and a little pattern paper. 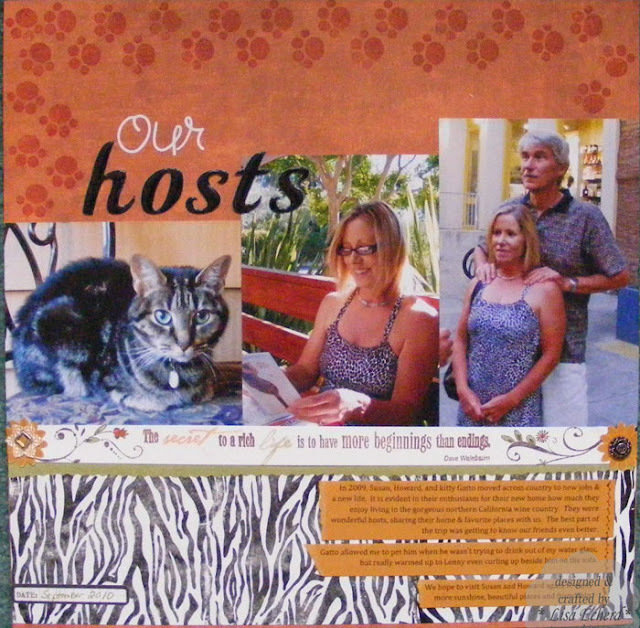 The inside shows the fourth photo and the journaling for the layout. It's a nice way to keep things in threes but still use 4 photos. Grommets and brads seem to fit the rustic look of the layout. I also got to use some older Basic Grey from my stash. Good thing because some of the new Basic Grey is on its way here! They released 4 new collections in the last few days! The one I ordered was on my wish list from the CHA previews. I have a companion layout to complete a double page spread for this that is still in progress. I'm using the same papers but in a different arrangement. Hopefully that will be up later in the week. I had a lot of fun this weekend just piddling around with these layouts in between painting, potting flowers and other outdoor tasks. Thanks for visiting. Stop by tomorrow for TIPsy Tuesday. I'll have a card idea for you. 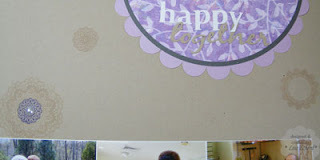 Ink: River Rock and Soft Suede by Stampin' Up! Brads and Grommets: Stampin' Up!